The starting of this writing occur completely in my head on Monday,5 days ago, While stuck in a traffic jam and through all the short cuts that taken. However, only today (that is Thursday) got the time to sit down and write things. So please bear with me. The pasar itself have 2 part. The wet market is mentioned in my previous writeup that is Lobsterlicios. The other part is Pasar Sayur, where 'sayur' means vegetable. Which actually have lot of stuff, and not just vegetable. Under one big roof with 2 level that contains a lot of stall. This is where you can find fresh veggies, fruits, poultry (chicken) and meat (beef) on the ground level. While the other level (first floor?) is mostly dry stuff like dried seafood or salted stuff. As you might guess, my target was the fresh fruit area. Buying pineapple is not exactly my favourite activity. Last time I was unreasonably charged RM8 per KG. So a little bit wary. After all, I don't look like neither talk like local people.Which is the type of people that usually can haggle the price. Any haggling that I do is usually just ignored. that is why normally it is my (younger) sister in law who buy stuff there. Knowing this, the best strategy is to survey among the many stall and get the lowest price. Believe it or not, there is like price fixing where almost all the stall sort of agree on 1 price that is displayed to customer on piece of cardboard. That day it is RM5 per kg. Believe me when I said, that is not the "correct" price which was offered to local people. Base on my experience buying meat. Which is advertised at RM15 per KG (local meat and not imported, it is that cheap in Sabah) but actually sold at RM14 per KG. So I take that "cardboard" value of RM5 and ask for RM4. Tried on 4 stall and get a stall that offer RM4.50 per KG. The choosen pineapple slightly over 1 kg. The lady offer me RM4.50 for that pineapple which I agree! Was on the phone with my wife to confirm the purchase, when the lady pull a calculator and become more calculative. Suddenly the offer change to RM 5.30. I have no idea about the lady intention. Where I come from it is called "bait and switch". So told her straightaway that I don't deal with people who change their price and walk. There I was, without pineapple and beginning to panic. By the way, it is normal practice to close one eye on extra weight. Another stall nearby actually make an offer of RM 5 for 1.2 KG pineapple. Just the other day at the wet market. I got 5KG when buying 4KG of Ikan Kayu (no idea what fish is that in English). These people are looking for long term business. Some of them even know me as frequent buyer for restaurant supplies. To balance above argument, clearly I am a cheapskate :D. The different is just RM 0.80, not enough reason to walk away. Kids, don't do this. Be generous and just close your eye. Perhaps they will give better discount next time. But of course there is purpose for writing all of this. It might help you guys, so please read on. Despite the panic. It ends well since another stall selling pineapple was found. It is a bit out of way and I was quoted RM3 per KG on first ask without any needs of haggling. Instant panic lost! The lesson is, ask around and trust your guts when there is a feeling of inflating price. Or even worst, when it is you, the person that is being priced and not the product. At the initial RM 5 per KG, I felt very handsome that day. Definitely felt damned handsome on the day when I was charged RM 8 per KG for pineapple! Leaving the pasar area feeling victorious. suddenly it occur to me that I have no idea how to go to the next location. Before rambling further about the roads. Let's talk a bit about buying computer stuff in Tawau. In KL, my favourite jaunt is Low Yat plaza. One big shopping complex with lot's of shop and choices. In Tawau, there is no such shopping complex just for computer stuff.Instead, there are shops scattered around the town. But the jewel is one solitary shop called Digital Wise. The price is almost Low Yat plaza price. Descent choice, but all the important stuff are there. As point for price comparison, The ink cartridge price is RM45 there while in Low Yat Plaze, the cheapest I get is RM42. Using credit card, there is additional 2% charges. Not bad compared to some other shop that ask for additional 4% on top of purchase price. I have mastered Tawau town road in my last trip. In which my stay was almost 3 month. However, on that particular Monday. Felt lost a bit. Not to mention about massive jam throughout main road that connect the pasar and other part of town. There happen my first detour plus a creative way of using a short 1 way passage. Let bellow map do the talking. (1) Felt lost and trying to avoid jam. Taking road of least resistant! (2) In the map there is no road. In fact it is a one way passage (i.e. no entry). Applying a little bit of creativity here. About 10 meter of creativity ;). (3) Encounter another massive jam here. Taking a back alley. This is not in the map and turn out to be a dead end. (4) No matter. Park the vehicle and walk about 5 meter across the street where the computer shop is! Manage to escape the road jam once. But how about escaping the town. There lies the second problem. Somehow have to balance distant and travelling time. So here is another short cut which is detour no 2. Note: Click to enlarge the map! (1) This will be easier if the alley is not a dead end. Avoiding traffic jam also means not taking shorter route downward. (2) It is good to know alternative route. In this case through housing area. Again the road is not in the map. (3) Traffic-light! This is important since other alternative will not allow crossing to the right side. There are actually another 2 road in parallel to the left and right. Both will require going to the very end of the road for U turn. (4) Arrival in 15 minutes. Surprisingly no jam at point (3). Might not be a good idea during evening rush hour. Morning and afternoon is ok though. Why only 1 pineapple? Upon arrival. the mystery was solved. It turns out my wife and her younger sister was planning for photo shoot session. Taking picture for nasi goreng (fried rice) stuff. Upon arrival, quickly snap bellow picture to demonstrate the activity. Previously it is me who took most of the picture for the restaurant. Apparently I was (or still am?) a lousy photographer. So this time, another younger sister took the picture. With one slight problem of still using my point and shoot camera. So the end result is not that much different from picture taken previously. I know for a fact that the other younger sister is a good photographer using her DSLR or my wife slightly ancient Canon 450D. Maybe I am not that lousy photographer after all. The advantage of P&S camera is small size and easy to carry. As opposed to the 450D that is gathering dust somewhere ;) as status symbol instead of a practical photography tool. Simply because it is to big to lug around and be useful. Anyway, the photo shoot session give birth to another promotional material. Which is done by you-know-who. Enjoy, until the next time! Update: Damn the Mee Rojak picture make me hungry. My lost not to have it during this short trip. The recipe is unique since it include strip of crispy fried egg. Cut to bite size for your enjoyment (believe me, this is important). 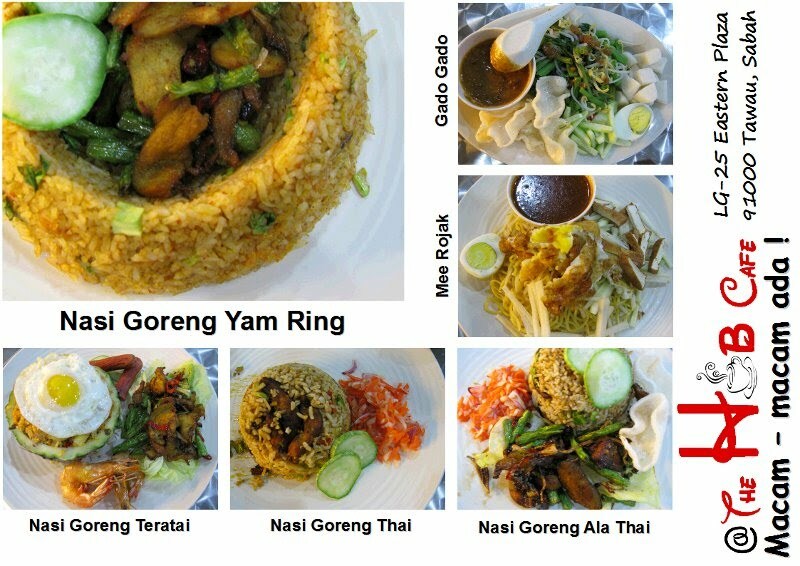 After the photo shoot, I got the Nasi Goreng Yam Ring. Since someone else already rsvp the Mee Rojak. Being stickler for detail, I quickly dip and taste both peanut sauce for Mee Rojak and Gado Gado. Their taste is differentiated by special mix for Gado Gado sauce. By the way, my wife has improved the Mee Rojak sauce recipe given to her by you-know-who. If you are rojak sauce (peanut sauce in English) lover. This is the chance to experience the different between Gado Gado and Rojak (same base material, different mix for unique taste). Have to travel to Tawau though ;).